So this blog is now spotlighted on the homepage of Livejournal, which is very exciting and flattering. If you’re reading this for the first time, hello, and please allow me to introduce myself (all apologies to Mick Jagger/Lucifer). In RL I am Josh Neufeld, a Brooklyn, NY-based cartoonist (e.g. comic book writer/artist) who speciaizes in nonfiction. If you’ve read Harvey Pekar’s American Splendor, or Art Speigelman’s Maus, or Joe Sacco‘s Palestine or Safe Area Gorazde, then you know comics can be a wonderful way to explore, explain, and illustrate the real world. If you haven’t read any of their work, then go out now and buy some! A.D. came about indirectly because I was an American Red Cross volunteer shortly after Katrina, where I worked for almost a month distributing food to Katrina survivors in Biloxi, Mississippi (about 90 miles outside of New Orleans). I wrote about those experiences as they were happening right here on my LJ, and eventually collected the posts — and readers’ comments — in a "blook," cleverly titled Katrina Came Calling. A little later, Jeff Newelt, the comics editor of the storytelling site SMITH, showed it to SMITH’s editor, who shortly thereafter asked me to do a comic about Katrina for his site. In January 2007, after about six months of research and reporting, and finding seven amazing, wonderful people willing to have their stories told in comics form, I began serializing A.D. on SMITH. Lo and behold, two-plus years later and a brand-new, expanded hardcover edition of A.D. debuts August 18 (right before the fourth anniversary of Katrina). I’m extremely excited for the book to be out, not only because it’s the culmination of many years’ work, but because I think it’s so important that we continue to tell the story of New Orleans. I made a big effort with A.D. to show my characters’ lives continuing on after the hurricane, as the city begins to forge its post-New Orleans history. Four years down the line a lot has happened — some good and some bad — but the rest of America (and the world) needs to keep the "City that Care Forgot" and its people in our hearts and minds. I’m also excited about A.D. because I truly do believe that nonfiction comics are a vital part of the comics mosaic, and my hope is that if enough copies of the book finds their way into the hands of people who wouldn’t normally pick up a "funny book," it will help break down the continuing prejudices against the form. I’m running on a bit, and I don’t want to bore my normal readers, so I’ll cut things short here. Normally, my blog is a place where I write about all sorts of things, not necessarily just comics, though I would say that 4-eyez (full title "Four-Eyes: Stories and Thoughts from One of Life’s Vagabonds") is mostly about what my comics are about: remarking on and treasuring the experiences of everyday life. Oh, and also my sad obsession with trivia, charts, and statistics. So look back through some of my previous posts to see what catches your fancy. Meanwhile, to take advantage of LJ’s kind spotlight, I plan on posting once a day for the remainder of the week. Stay tuned! Gustav in the Gulf: Here we go again? The third anniversary of Hurricane Katrina has just passed, and now another huge storm — Gustav — is bearing down on the Gulf Coast and New Orleans, with forecasts of it hitting the area late Monday. Predicting a hurricane’s path is a very imperfect science, so it’s possible the city may dodge the bullet (as it had so many times in the past—before Katrina). But Katrina taught us that it’s far better to be safe than sorry. New Orleans mayor Ray Nagin called Gustav “the storm of the century” and ordered a mandatory evacuation of the city today. Thousands of people are streaming out of the region as I write this. Things seem to be proceeding much more smoothly this time than in 2005, with government agencies working together to provide transportation options for just about everybody. Trains and buses are ferrying evacuees to Alexandria, Shreveport, and other northern Louisiana locations—and this time people can take their pets. To deter looting, the National Guard plans on sending a lot more troops into the city this time around. As an incentive to get everyone to leave, New Orleans is not providing any “shelters of last resort” (like the Convention Center or the Superdome), which seeing what happened at those places after Katrina might be a good thing. Even though the levees have been repaired and “shored up” since Katrina, they are still not designed to withstand more than a Category 3 hurricane; Gustav could end up as a Category 5. The A.D. characters are all preparing for the storm in their own ways. As a Hurricane Katrina Red Cross volunteer, I was invited to commemorate Katrina’s one-year anniversary by taking part in tomorrow’s NASDAQ closing bell ceremony. And it will all be viewable on web-cam! So look for me in a gaggle of NY-area Red Crossers as we mark the hurricane by celebrating the unstoppable storm of hyper-capitalism. 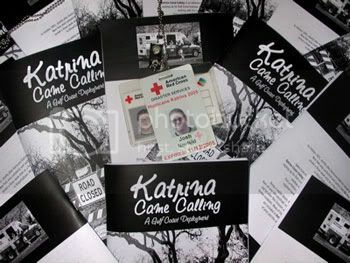 After a week’s delay at the printer, I finally got my 100 copies of Katrina Came Calling. It’s exciting to have a tangible testament to my Mississippi adventure. I’ve already sent out copies to all those who ordered them (thank you very much! ), as well as the comps to the folks who contributed to the project (thank YOU very much!). I also plan to bring a bunch to the New York Comic-Con, which will be happening at the Javits Center next weekend (Feb. 24-26), and where I’ll be at the Alternative Comics table. As many of you know, in October 2005, shortly after Hurricane Katrina struck the Gulf Coast, I served a three-week stint as a Red Cross volunteer in Biloxi/Gulfport, Mississippi. 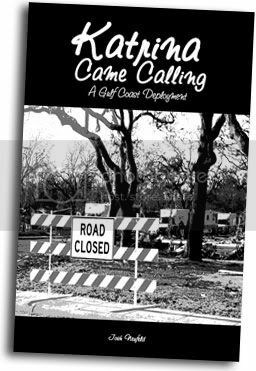 I’ve just self-published Katrina Came Calling, a book (not a graphic novel!) about my experiences. Taken from my LJ from that period, Katrina Came Calling is an intimate look at my reaction to the hurricane; signing up for Red Cross training; getting deployed; the conditions in the Gulf; working with the survivors; a visit to New Orleans; Port-a-Potties; my co-workers; issues of race, religion, and regional background; returning home; and much more. It also includes tons of photographs and a brand-new introduction. And — in a unique marriage of print and the ongoing conversation of the Internet — Katrina Came Calling includes many of your comments — and my responses to them. They augment the discussion, inform the reader, and otherwise enhance the project. To all those who read my online journal and took time to respond, you inspired me to keep going, both as a volunteer and as a documenter of the experience. Specifically, these folks “made the cut”: aciddust_420, alibi_shop, al_monster, deadredfred, drockdamian, l8blmr, leborcham, man_size, nexusnrg, purvision, pivovision, rojogato, spaceman_fromrc, sugarc0atdlies, thamesrhodes, tracerchick, and wjcohen. (Throughout the book, I use your LJ screen-names — partly for privacy reasons and partly because I don’t know some of your real names!) In addition, Michael Simon and a few non-LJ users left anonymous comments. This self-published booklet is a limited-run “vanity” edition, and as such, I beg your forgiveness for using your words without getting your prior permission. I am offering the book, such as it is, free of charge to everyone cited above. If, after seeing the book, you would rather I took out your comments, just let me know, and I will remove them from all future editions (if there are any). Hopefully, that won’t be the case! So there we go. Katrina Came Calling is: limited-edition, 100 print-run, black-and-white, digest-sized, saddle-stitched, 102 pp. If you’re one of those cited above, claim your free copy by emailing me at joshcomix@mindspring.com with your real name and mailing address. Anyone else who’d like a copy can send $5 to: Josh Neufeld, 175 Eastern Parkway, #5C, Brooklyn, NY 11238. Recently I’ve been watching a lot of World War II movies. My local library has a bunch of classics on DVD and I’ve been picking up just about everything they’ve got. I started with black-and-white films like The Best Years of Our Lives and From Here to Eternity, and moved on to Twelve O’Clock High, Stalag 17, and a couple of John Wayne flicks, The Sands of Iwo Jima and They Were Expendable. I augmented those with movies of more recent vintage: Saving Private Ryan, Schindler’s List, The Sand Pebbles, The Big Red One, A Bridge Too Far, Windtalkers, Pearl Harbor, Enemy at the Gates, Charlotte Gray, The Great Raid. Those viewings are just in the last few months. Over the years I’ve probably seen 75 or more WW II movies, including many of the ones above previously. A few are great, many are good, many are dreck — the point is I’m obsessed. I grew up in the 70s and 80s fixated on the Vietnam War and Vietnam-era movies. Beginning with (of all things) Magnum P.I. (remember he was a Vietnam vet?) and First Blood (embarrassing! ), and moving on to staples like Apocalypse Now, The Deer Hunter, Platoon, and Full Metal Jacket. As the years passed, I gobbled up more and more: Born on the Fourth of July, Coming Home, Big Wednesday, Good Morning Vietnam, Air America, The Boys in Company C, In Country, Hamburger Hill, Hearts and Minds, 84 Charlie MoPic, Casualties of War, Jacob’s Ladder, Tigerland, even apologist crap like The Green Berets. I gloried in the moral ambiguity of those films.